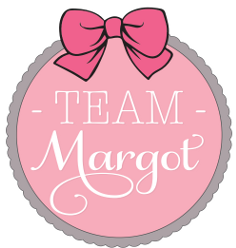 I registered as a donor in January 2014 when I heard Margot’s story from a friend. I couldn’t believe it was so easy as to swab your mouth, and then you were registered as a donor. 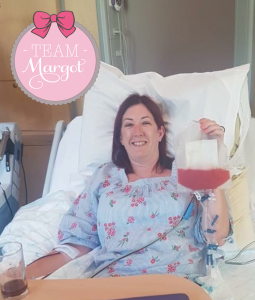 And I couldn’t believe that children as young as Margot were suffering with illnesses like this, when a transplant could make all the difference. 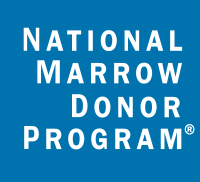 I didn’t think anymore of it, until March 2018 when DKMS contacted me as I had been matched to someone needing a stem cell transplant. I couldn’t believe it, I never actually thought I would ever be a match for anyone! When DKMS asked if I was prepared to go through with the donation, I didn’t hesitate. How can you say no, when you know you might be saving someone’s life!? 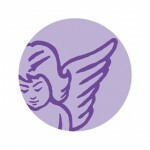 The process started with a trip to the doctors for some blood tests, which all came back fine. I then needed to go to London for my “MOT” as I called it, to check that I was healthy and fit enough to go through the procedure. Typically on the day in June when I was due to go to London, I had a stinking cold! I was so worried I wouldn’t be able to go, but after a phone call to DKMS, I was on the train and London bound. Not feeling 100%, I was pleased to get the all clear, and so my donation was set for a later time. DKMS explained everything every step of the way, and I knew if I needed to ask anything I could give them a call. The procedure involved having GCFS injections for the 4 days leading up to the donation, to boost my stem cells. I was told of the side effects, and apart from a headache and some back ache, I was fine. My Mum took the time off work and came with me. So we were back to London for an overnight stay, all ready for the donation the next day. 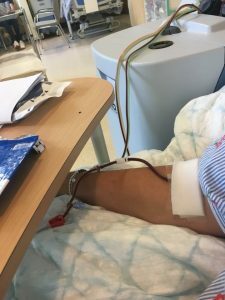 I donated for 4 hours, and although it was a bit uncomfortable, and it made me feel pretty tired, I couldn’t help but feel so grateful that I was heathy enough to go through something like this. 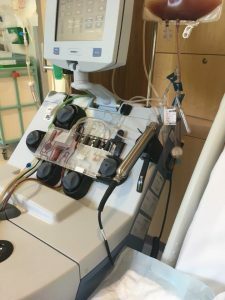 Unfortunately after they’d tested some of the stem cells, they didn’t quite have enough for a full donation, and so we needed to stay another night in London, and go through the same procedure again! So I was given another GCFS injection and was told to come back again the next day. All was not lost, as we managed to see a show on the evening! Unfortunately when I woke up the next day I had terrible diarrhoea! I couldn’t believe it. I was really concerned that I wouldn’t be able to donate. Being stuck to a bed for 4 hours when you can’t really use the loo, wasn’t very appealing at that point!! I managed to get myself to the hospital, and the nurse put me at ease straight away. She said it was probably due to the levels of GCFS I’d had as I’d needed the extra dose. A couple of Imodium and I was good to go, although feeling slightly nervous!! All went fine though, and I only needed to donate for 3 hours in the end. And that was that! We were back on the train and on our way home. A few weeks later DKMS phoned me to let me know that my donation was sent to a 60 year old woman in Finland! Wow, my stem cells flew all the way to Finland! I couldn’t believe it. I am able to receive updates at 3 months, 6 months, 12 months and 24 months. I am also able to correspond with my patient anonymously if I want to. I was going to wait for the first update, and then write to them and ask how they are doing. I really hope that my donation makes a difference. If anyone reading this is thinking whether they should sign up or not, please do it! Such a relatively simple process, and you could potentially save someone’s life. 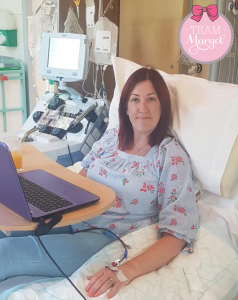 I’d like to think that if someone I loved was ill and needed a transplant, there was someone like me out there, willing to put themselves out just a tiny bit, for such an important, potentially life changing reason.